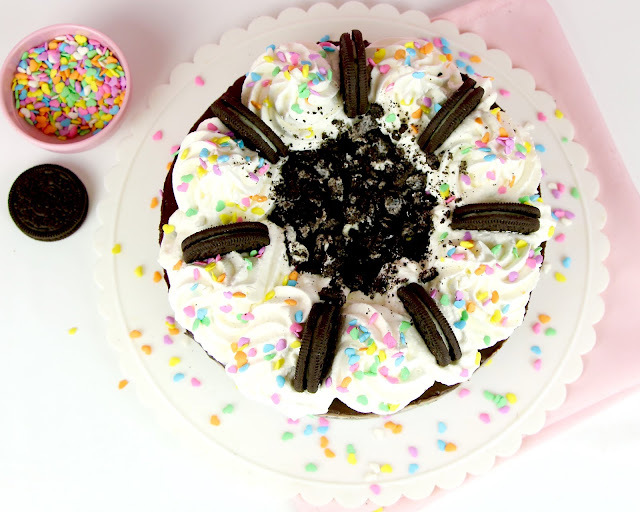 This easy no-bake cheesecake has a smooth and ultra creamy no-bake filling, bursting with colorful rainbow sprinkles and chunks of real Oreo cookies in every bite, piled on top of a 2-ingredient chocolate Oreo crust, all topped off with fudgy ganache and toppings galore! 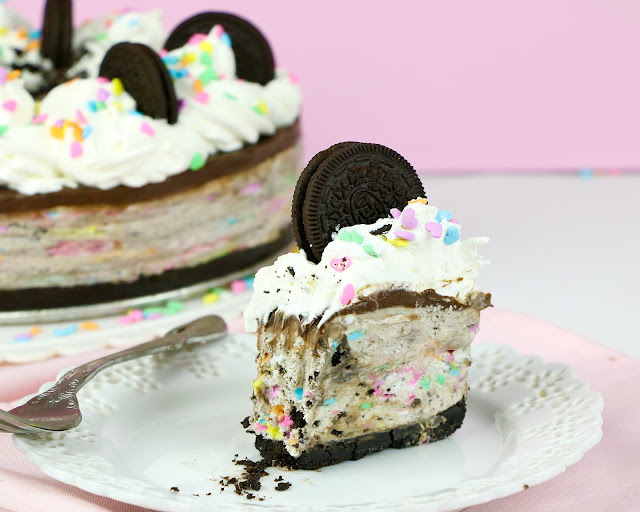 You just can’t beat this combination of cookies and cream in cheesecake form, all made in like 20 minutes. 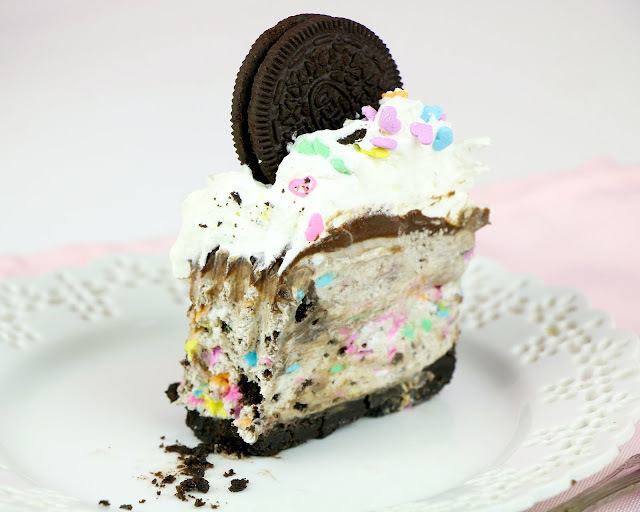 It literally tastes just like an ultra gourmet baked cheesecake, from a fancy restaurant, except it is sooo much easier to whip up at home with only a few ingredients! 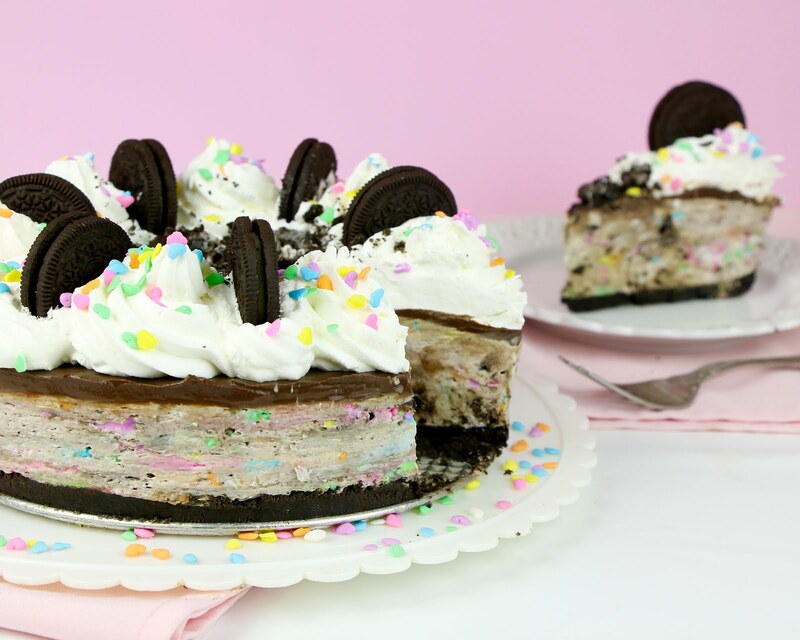 No bake desserts are some of my faves to make, because you don't even need the oven to make them, they are perfect for beginners and are always a crowd pleaser! 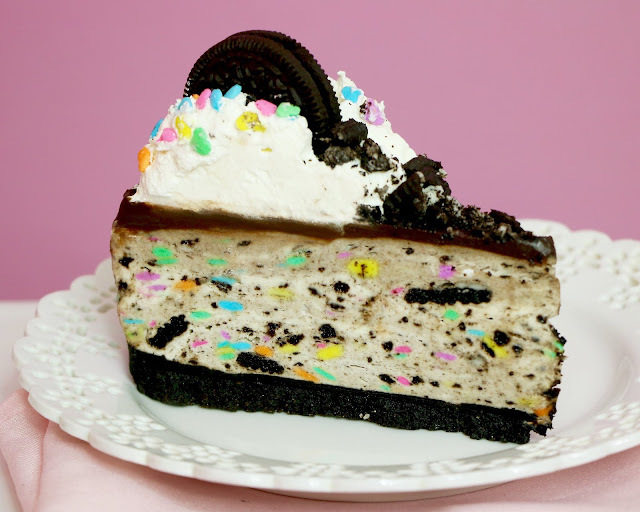 And this cheesecake you guys, is seriously one of the best cheesecakes I have ever had, seriously! 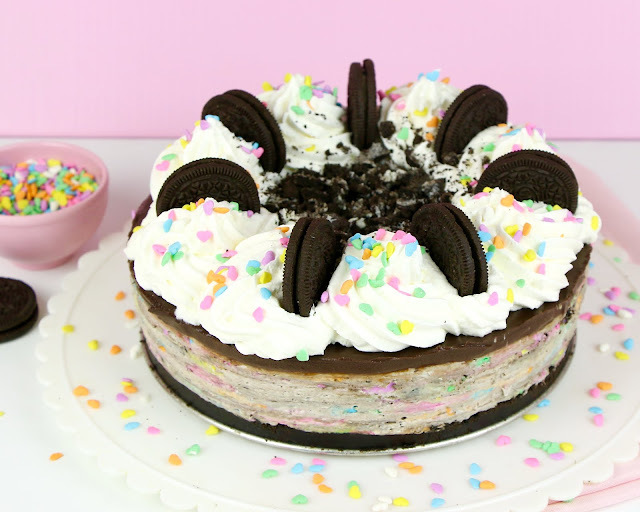 If you give this a try be sure to tag me in a picture on social media @thelindsayann, or share this video with somebody who you know would love this cheesecake! 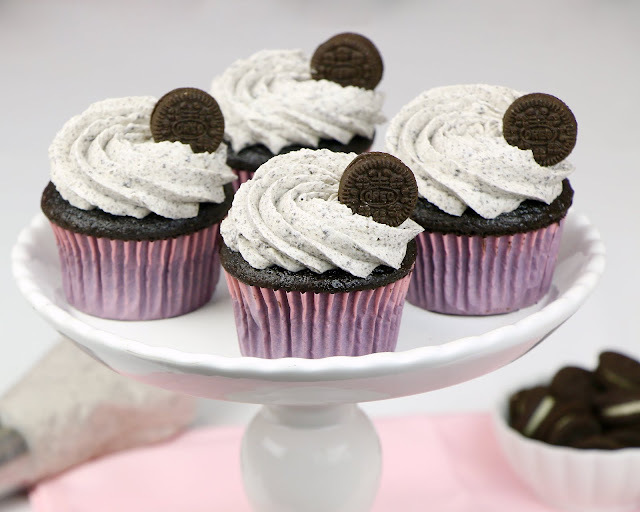 ...or my Cookies and Cream Cupcakes, so be sure to check those videos out too! Crush 26 Oreo cookies into fine crumbs, using a food processor (or crush in a plastic ziploc bag). Add the melted butter until well combined. Press mixture evenly onto bottom of a 9-inch springform pan. 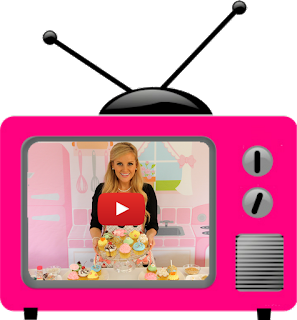 Place in refrigerator while preparing the filling. In a large mixing bowl, beat the cream cheese with an electric mixer until smooth and creamy, until no lumps remain. Add the powdered sugar and vanilla extract, beating until fully incorporated. Scrape down bottom and sides of bowl. Gently fold in one 8oz tub of cool whip and then beat on low speed to incorporate fully. Chop 15 Oreos. 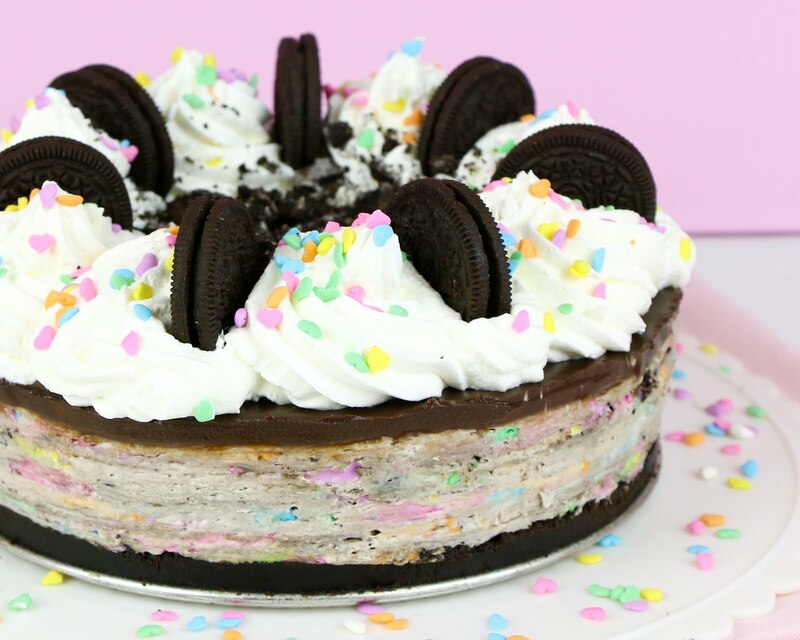 Fold in chopped Oreos and confetti sprinkles. Spread evenly over crust. Heat cream just until it starts to simmer and little bubbles start forming. Add chocolate and let sit for a minute and then gently stir until smooth. Let cool slightly until thick and pourable, but no longer hot. Pour ganache over the top, spreading it to cover the entire surface. Tap against the counter to smooth the top. Chill the cheesecake in the freezer for at least 3-4 hours (or refrigerate overnight). Before serving, remove from pan. Pipe swirls of cool whip around the top. 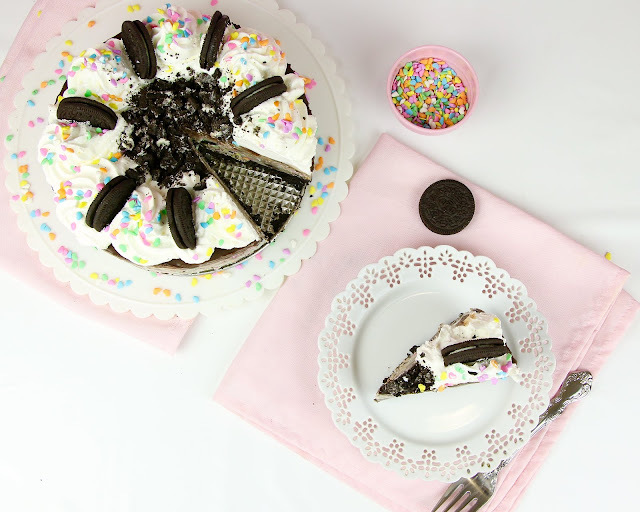 Finish with whole Oreos and sprinkles. 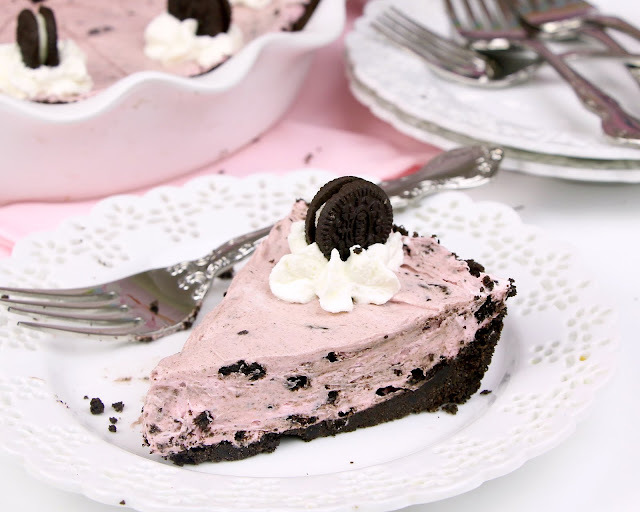 Refrigerate any leftovers, or freeze for an "ice cream pie" texture.